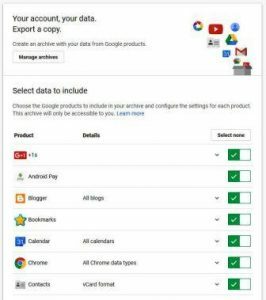 Pretty much everyone uses Google, from our Gmail accounts and browsing behaviour through to Calendars, Contacts, Youtube and Photographs there is a lot of data they potentially hold on you, me and all the other Google users around the world. All you need to do is click onto the Google Takeout site and log in as you would for any other Google tools. Once you’ve done this you can take a backup of any or all the data they have. All you need to do is select the format to save in (.zip is usually easiest) then you can set how you would like the data delivered, say by email or to your Dropbox and even set a data limit so you don’t exceed your account limit. Job done! Even if you didn’t want to do this to find out what data Google hold, it’s always useful for taking a backup, for example of all your gmail messages. You can probably then transfer them to another email account if you wish (I’ve not tried this out myself though so don’t quote me on it!). ← How Can an SEO Company Guarantee First Page in Google?